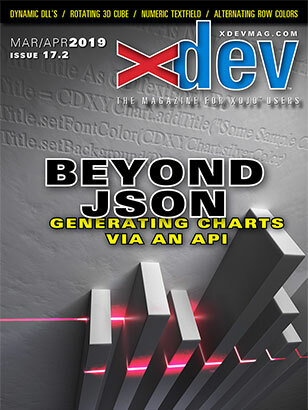 The March/April (17.2) issue of xDev Magazine is now available! Creating a numbers-only textfield sounds easy, but as Markus demonstrates, it's trickier than it looks. If you're on Windows and need help managing DLL's, Eugene shows how to load them dynamically in your Xojo apps. Last issue Tim showed how to create an API to generate barcodes. Now he's back to demonstrate an API for charts and graphs. We've been making alternating row colors for our listboxes for yearsâ€”but that was before Dark Mode. Suddenly it's a tricky problem, but Christian has the answer. Some people think Xojo can't do graphics, but here's a great demo of a rotating 3D cube in pure Xojo code. PLUS: Creating custom events, XDC 2019, new Xojo docs, Flashing windows on Windows, MarkdownDS, Best of the Web, and more! If you're not already a subscriber, you're missing out! In April 2016, xDev Magazine purchased the Xojo article site RBLibrary and rebranded it xDevLibrary. There you can buy individual articles, Xojo programming books, and more, all delivered to you instantly. Check out xDevLibrary today! Buy issues instantly via Gumroad and have your PDF in seconds! If you like this, please let me know and I'll make more issues available in this manner. 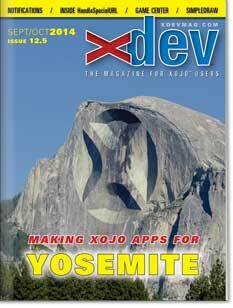 xDev Magazine went digital-only in 2008, but now we're bringing back print subscriptions! You can read more about them on our Print Subscriptions page. xDev Archive 15 Printed Book Now Available! 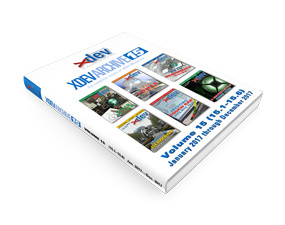 xDev Archive Volume 15 is a 538-page perfect-bound book that is a great way to get a full year's worth of a magazines in print form in a single volume. Order it today! We're in the processing of indexing all our published articles by topic. You can check out the online index here. Let us know what you think of this feature! Click here for more Xojo News. If you have news you'd like xDev to publish, send it to .